Rotary Youth Leadership Awards (RYLA) is Rotary's leadership training program for young people. 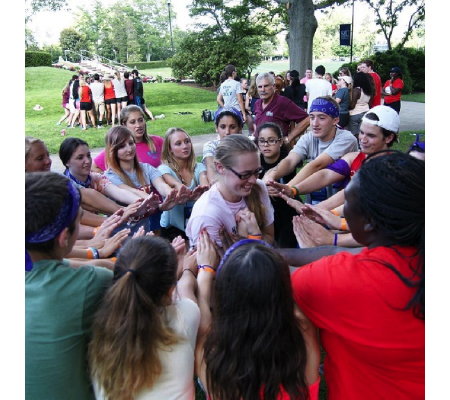 In District 7500 (Monmouth, Burlington & Ocean Counties, NJ) RYLA participants are always selected from high school students, usually from Sophomores and Juniors, but sometimes exceptional Freshmen are chosen, and on very rare occasions, high school Seniors have been sent. District 7500 has been conducting RYLA programs since 1995 and has gained a reputation among Rotarians and educators around the country as one of the best RYLA programs in existence. First, we truly believe that this is a Youth Leadership program and trust that concept so much that most of our program is delivered and facilitated by our own RYLA graduates. Each year the very best and most enthusiastic RYLA participants try out for a spot on our staff team. Only the very best are selected and they tend to return year after year, getting better and better with each year's experience. We firmly believe that nothing in the world is perfect; which is great! Because that means everything in the world can be improved. And every little aspect of everything. We spend many, many hours each year examining our program in minute detail, to find as many ways to improve it as we can. Every year we implement dozens - if not hundreds - of improvements to make our program better in myriad ways. Go to www.RYLA7500.org to apply today. Coordinate participants’ paperwork, housing and transportation to/from Conference. Organize visitation by participants at Club meeting after event.